The Space Shuttle Endeavour is seen atop NASA's 747 Shuttle Carrier Aircraft No. 911. In this historical photo from the U.S. space agency, NASA's 747 Shuttle Carrier Aircraft No. 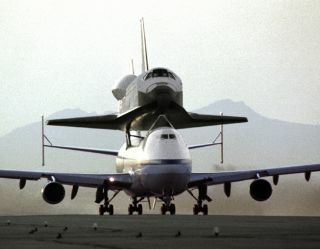 911, with the space shuttle orbiter Endeavour securely mounted atop its fuselage on May 2, 1991, taxies to the runway to begin the ferry flight from Rockwell's Plant 42 at Palmdale, California, where the orbiter was built, to the Kennedy Space Center, Florida. At Kennedy, the space vehicle was processed and launched on orbital mission STS-49, which landed at NASA's Ames-Dryden Flight Research Facility (later redesignated Dryden Flight Research Center), Edwards, California. NASA 911, the second modified 747 that went into service in November 1990, has special support struts atop the fuselage and internal strengthening to accommodate the added weight of the orbiters.